When the world went into heavy drug abuse, the problem of drying out became one of the first order. All pre-Scientology efforts to help drug users failed—and had been failing throughout man’s history. However, workable solutions have been developed in Scientology which enable a person not only to cease drug use, but to reach and eradicate the root causes which started him or her down that dark road. Drugs can extract a dreadful price from the user should he ever try to quit. What is called withdrawal symptoms set in. These are the physical and mental reactions to no longer taking drugs. They are ghastly. No torturer ever set up anything worse. B. Try to come off the drugs and be so agonizingly ill meanwhile that he couldn’t stand it. This was a dead-if-you-do, dead-if-you-don’t sort of problem. Medicine did not solve it adequately. Psychotherapy was impossible. 1. Nutritionist experiments indicate that vitamins and minerals assist the withdrawal. 2. Light Objective Processes ease the gradual withdrawal and make it possible. A process is an exact series of directions or sequence of actions taken to accomplish a desired result. Its application is called processing. There are many processes contained in the materials of Scientology which can be used to help a person direct his attention off himself and onto his environment and the people and things in it—an action which is very therapeutic for someone coming off drugs. These are called Objective Processes. When properly used, they ease the person’s symptoms and make drug withdrawal possible with a minimum of discomfort. Objective refers to outward things, not the thoughts or feelings of the individual. Objective Processes deal with the real and observable. They call for the person to spot or find something exterior to himself in order to carry out the procedures. The Objective Processes referred to here are called “light” Objective Processes in that they are simpler and less advanced than other Objective Processes which exist in Scientology. The details of how to use these two approaches to getting someone unhooked from drugs follow. If you know someone who is dependent on drugs, you can help him withdraw from them by applying the principles and techniques given here. On severe cases of drug addiction one should send the person to a qualified medical doctor for examination to determine if there are any special precautions that may need to be taken for that particular person. Some persons may have been put on some therapeutic drug by a medical doctor and possibly should remain on it. But these are not the usual drugs we are dealing with. It is up to the person and the doctor what should be done in such cases. According to world-renowned nutritionist Adelle Davis, vitamin therapy has had success in handling withdrawal symptoms. Instead of just telling the person to break off drugs with all that suffering and danger of failure, the patient is given heavy doses of vitamins. The data is repeated here for information. 1,000milligrams of niacinamide (not nicotinic acid). This helps counteract any mental disturbance. 5,000 IU of vitamin A. 800 IU of vitamin E.
2,000 milligrams of vitamin C.
500 milligrams of magnesium carbonate (to make the vitamin C effective). 200 milligrams of B complex. 100 milligrams of pantothenic acid. This formula should be given four times a day while a person is coming off drugs, roughly every six hours. It should not be taken on an empty stomach, as it could cause stomach burn. It should be taken after meals or, if taken between meals, with yogurt. Great caution must be taken to give the dose in such a way that the vitamins will not corrode the stomach. If this is neglected, the person can be given a false duodenal (upper intestine) ulcer and will be unable to continue the treatment. Drug users are usually in terrible physical condition anyway. Thus, the vitamins would have to be in “enteric coated” tablets, meaning an intestinal shielding must be on the pills so they gradually dissolve and don’t hit the sensitive upper stomach hard enough to corrode it. Thus, milk with powdered amino acid in it would have to be given to wash the pills down. In testing these recommendations, stomach corrosion (wearing away) from the vitamin formula was the main barrier noted. If the formula is given without any cushion, the person can (a) feel too full after eating, (b) have a stomachache, (c) have a burning sensation, (d) the exterior of the stomach can get sore. These are all stomach ulcer symptoms. If such symptoms turn on, end off the vitamins. aluminum hydroxide tablets chewed up and swallowed in milk each time the symptoms start will ease the stomach. Powdered amino acids, yogurt and milk must then be given until the stomach gets better. The potential benefits of the drug bomb far outweigh any possible drawbacks and so it has much value. The difficulties and agonies of withdrawal are the primary failure point in trying to salvage a being from the insanity of drugs. Used in conjunction with the drug bomb, there is an additional method of alleviating drug withdrawal symptoms which involves use of the minerals calcium and magnesium. Muscular spasms are caused by lack of calcium. Nervous reactions are diminished by magnesium. Calcium does not go into solution in the body and is not utilized unless it is in an acid. Tests for other uses than drug reactions brought about the means of getting calcium into solution in the body along with magnesium so that the results of both could be achieved. The answer was to add vinegar, which would provide the acidic formula needed. The use of Cal-Mag, experimental in the early 1970s to help ease withdrawal symptoms, is now long past the experimental stage. Cal-Mag has been used very effectively during withdrawal to help ease and counteract the convulsions, muscular spasms and severe nervous reactions experienced by an addict when coming off drugs. The Cal-Mag Formula uses a ratio of one part elemental magnesium to two parts elemental calcium, mixed with vinegar in water. As the formula calls for precise amounts of calcium and magnesium, some further explanation of these quantities should be given here. The Cal-Mag Formula is made using the compounds calcium gluconate and magnesium carbonate. Both of these come in white, powdery form. Each is a compound of different substances. In other words, calcium gluconate contains other substances besides calcium; it is not all pure calcium but contains only a percentage of pure elemental calcium. Similarly, magnesium carbonate contains other substances besides magnesium, and includes only a percentage of pure elemental magnesium. But it is the amount of elemental magnesium in correct ratio to the amount of elemental calcium that is important in the preparation of the Cal-Mag Formula. This does not mean that you use pure magnesium or pure calcium when you make Cal-Mag. Use only calcium gluconate and magnesium carbonate. There are different magnesium compounds with different percentages of elemental magnesium, but using any kind other than that recommended here will give varying amounts of magnesium which will violate the needed ratio of one part magnesium to two parts calcium. It is magnesium carbonate basic, containing 29 percent elemental magnesium which is used in making Cal-Mag. And it is essential to ensure that the magnesium carbonate basic which is used is fresh, not old. Calcium Gluconate: There is only one kind of calcium gluconate compound and nine percent of that compound is calcium, so there is no problem in selecting the correct calcium gluconate compound for the Cal-Mag preparation. 1. 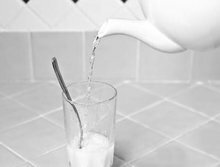 Put 1 level tablespoon (15 ml) of calcium gluconate in a normal-sized glass. 2. Add ½ level teaspoon (2.5 ml) of magnesium carbonate. 3. Add 1 tablespoon (15 ml) of cider vinegar (at least 5 percent acidity). You can make larger quantities at one time, simply by multiplying all the ingredients accordingly. The solution will stay good for two days. It can be made wrongly so that it does not dissolve. Variations from the above produce an unsuccessful mix that can taste pretty horrible. Anything from one to three glasses of this a day, with or after meals, replaces any tranquilizer. It does not produce the drugged effects of tranquilizers (which are quite deadly). It has proven effective in helping to handle the muscular spasms, tics and nervous reactions that can occur as a result of drug withdrawal. It should be mentioned that many health food stores do carry premixed preparations of calcium and magnesium. Before using any of these in place of Cal-Mag, one should read the label to see if the calcium and magnesium are given in correct proportions and check if it contains acid (such as ascorbic acid or citric acid). Otherwise, such preparations are worthless and will not give the same results as the Cal-Mag Formula. 1. 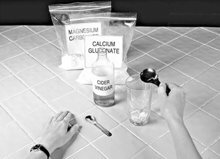 Put 1 level tablespoon (15 ml) of calcium gluconate in a normal-sized glass. Use a measuring spoon, not tableware. 2. Add ½ level teaspoon (2.5 ml) of magnesium carbonate. Again, use a proper measuring spoon. 3. Add 1 tablespoon (15 ml) cider vinegar (at least 5 percent acidity). 6. Fill the remainder of glass with lukewarm or cold water. Fill the remainder with lukewarm or cold water. (1904–1974) prominent American nutritionist who started her career by working with physicians in clinics planning diets for patients and then began a private consulting practice giving advice to thousands of people suffering from a numerous array of known diseases. After 1958 she devoted herself to lecturing and writing and produced four bestsellers: Let’s Cook It Right, Let’s Have Healthy Children, Let’s Eat Right to Keep Fit and Let’s Get Well. one thousandth of a gram (.0000353 ounces). a flush-free form of niacin, a vitamin which occurs naturally in foods such as cereal grains, eggs, liver and vegetables, and is used in medicine chiefly for preventing skin diseases. another name for niacin, a vitamin which occurs naturally in foods such as cereal grains, eggs, liver and vegetables, and is used in medicine chiefly for preventing skin diseases. abbreviation for International Unit, a measured unit based on an internationally standard amount of something (such as a vitamin) needed to bring about a certain response in the body. a vitamin found in some yellow and dark green vegetables, and also animal products such as egg yolk, milk and fish-liver oils. Vitamin A aids in the health of the outer layer of cells in the skin and organs. a vitamin found in such foods as egg yolks and liver, and manufactured by the body in the skin through exposure to sunlight. Vitamin D enables the body to absorb and use calcium, a mineral vital to the health of bones and teeth. a vitamin naturally occurring in vegetable oils, butter, eggs, cereal grains and leafy green vegetables. Vitamin E plays a role in forming red blood cells, muscle and other tissues, and is important for fertility in humans. a water-soluble vitamin found in citrus fruits, tomatoes, raw onions, raw potatoes and leafy green vegetables. It helps promote healthy gums and teeth, aids in mineral absorption, the healing of wounds and the prevention and treatment of the common cold. Vitamin C reacts with any foreign substance reaching the blood and helps to detoxify the system and prevent toxic reactions caused by drugs. a form of magnesium found naturally in the earth and used in medicines for its calming effect on the nerves. It dissolves in acid, but not in water or alcohol. Also called magnesium alba; alba is the Latin word for white. a group of vitamins found in yeast, cereal, nuts, eggs, liver and some vegetables. B complex includes vitamins B1, B2, niacin (vitamin B3), B6, B12 and others, and helps in breaking down carbohydrates. vitamin B5, found in meats, lobster, poultry, eggs, liver, soybeans, lentils, yogurt, avocados, mushrooms, sweet potatoes and yeast. It plays a role in chemical reactions essential for cell growth and helps the body’s resistance to allergies and infections. a white bulky powder used to neutralize or reduce excess acidity in the stomach. a sudden (violent) irregular movement of the body caused by involuntary contraction of muscles. a mineral the body requires for healthy teeth and bones. It occurs naturally in various foods including dairy products and dark-green leafy vegetables. a form of magnesium found naturally in the earth and used in medicines for its calming effect on the nerves. It dissolves in acid, but not in water or alcohol. Alba is the Latin word for white. Also called magnesium carbonate or magnesium carbonate basic. 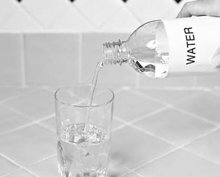 an abbreviation for milliliter, a unit of volume equal to one thousandth of a liter (1 liter is equal to 34 ounces). another name for vitamin C, a water-soluble vitamin found in citrus fruits, tomatoes, raw onions, raw potatoes and leafy green vegetables. It helps promote healthy gums and teeth, aids in mineral absorption, the healing of wounds and the prevention and treatment of the common cold. Vitamin C reacts with any foreign substance reaching the blood and helps to detoxify the system and prevent toxic reactions caused by drugs. a weak colorless acid present in citrus and other fruit. It is obtained commercially mainly from lemon, lime or pineapple juice. a unit of volume equal to 34 ounces.